After the launch of the Vivo V15 and Vivo V15 Pro smartphones in the country, Jio announced the Jio offer. In the Jio offer, the Jio subscribers will get a huge benefit of Rs 10,000 and up to 3.3TB of data in the purchase of any Vivo smartphone among the two. Reliance Jio has unveiled the benefits it is giving in the “Jio Vivo Cricket Offer” on any one of the Vivo to the Jio subscribers. The company will give a total benefit of Rs 10,000 as recharge cashback at Rs 6,000 while on the other hand other benefits will be given as the coupons for which the company associated with Myntra, Paytm, and Cleartrip along with others. >Maximum cashback on international hotel bookings in Cleartrip wallet is of worth Rs. 1,000. 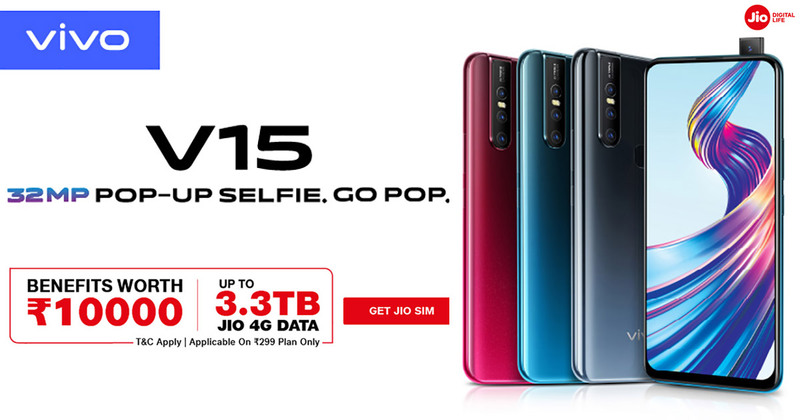 The person who is a Jio user and must also purchase the Vivo V15 and Vivo V15 Pro on the dates on or between 6th March and 3rd June will be the eligible candidate for availing the benefits of the “Jio Vivo Cricket offer”. The benefits must be availed by the same person who has the Vivo smartphone and is a Jio user i.e. it cannot be transferred and the benefits must be availed before 31st May. on the other hand, the Cleartrip wallet cash can be used just before 60 days of expiration. The company also gave full details of the data the users will get for the recharge of Rs 299 prepaid plan. For the users who recharge of Rs 299 for 28 days will get 3GB per day and the recharge must be done continuously for 40 times. The total data will be 3.3TB i.e. 3,360GB. Jio announced all the details about the benefits the Jio subscribers and Vivo smartphone (Vivo V15 and Vivo V15 Pro) customers will get.